Make time for mindful breathing every day with this special pendant. Peace of mind can be hard to find. In our busy lives, it's difficult to take those moments to breathe in and out, easing our bodies and minds into relaxation. With this special necklace, though, you can wear a reminder to do just that every day. Inspired by a conversation with a flute-maker who taught them about ancient Japanese monks and their breathing techniques, Todd and Vanessa Steinberg created a pendant that encourages slow, conscious breathing. 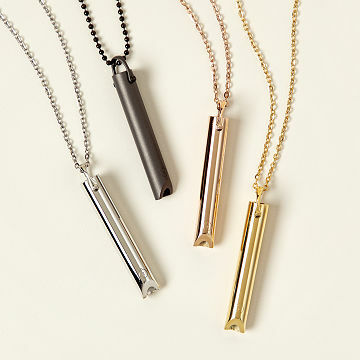 Simply exhale through the pendant (don't worry, it's not a whistle), and you'll soon find yourself in the midst of a mini meditationyour heart rate slows, toxins are said to be released, and you return to the present moment, where you belong. Made in Pawtucket, Rhode Island. Hey you, Vanessa and Todd Steinberg want you to put down your phone for a moment and juuust breathe. Believing deeply in the benefits of slowing your breath to shift your mind, the couple consulted with a psychotherapist friend and meditation teacher to create a small tool that encourages the ideal exhale. With Vanessa's background in fashion design, the tool was easily transformed into a pretty, wearable pendant. The two hope that with their tool they can help others quiet their busy minds and enjoy the present moment. Wipe down with soft anti tarnish cloth. I have noticed some people complaining about whistling. In the instructions, it makes it clear that you are not really supposed to actively blow out of it. More of a relaxed breath release, which does not create any noise. Wonderful product & wonderful company! I use this several times daily to deal with stress and a high heart rate. It's absolutely beautiful and can be worn with anything. I also use this in my busy office because it's silent and doesn't disturb my coworkers. Also doesn't bother my pets. See comments above. Trying to slow breathing in stressful situations. Works perfectly . Also , very beautiful . No one else knows why I wear it . Others just think it is beautiful . It was a great find . I love it ! It's hard to use this for meditation breathing because of the whistling. My friend and colleague is delighted with this gift! Perfect gift, would buy more of these!